As you get home from a sports game, you check the clock. It’s 10 p.m. and you have tons of homework due tomorrow that you haven’t completed. Even though you can feel yourself beginning to crash, you start working anyway, checking your phone along the way to catch up on today’s feed. Finally, you decide to sleep around 1 or 2 a.m., hoping to wake up again in a few hours to get back to work. While this situation may not be familiar to everyone, many students find themselves staying up late in attempts to balance homework, family time and social life and end up sacrificing their sleep along the way. With the stress of trying to find this balance, the routine may be easy to fall into. In a survey of 274 students, 83 percent said they wish they got more sleep. This lack of sleep and prioritization of other activities over sleep has become normalized within our school. In fact, although students want sleep, 55 percent said they would prioritize homework over it. 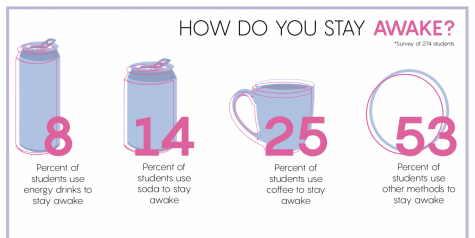 So, how does this lack of sleep actually impact your everyday life? A lack of sleep directly affects a student’s health on all levels: mentally, physically and socially. According to Excellhealth Sleep Center medical director Manzia Ehtesham, not getting eight to 10 hours of sleep is detrimental to overall well-being. In terms of human biology, sleep is also the time that the body takes to recover and heal from everyday actions. According to science teacher Eric Thomas, who teaches Human Anatomy, sleep is therefore the most critical component of maintaining a healthy lifestyle. In addition to physical rest, Thomas said that sleep also plays a role in mental health. For senior Jessie Haase, who gets three to five hours of sleep per night on average, the physical impact of not getting enough sleep is noticeable. Although junior Julie Brown gets an average of nine or more hours of sleep per night, her experience with not getting enough sleep is similar to Haase’s. According to Ehtesham, a consistent lack of sleep can also lead to long-term problems, including several chronic diseases like diabetes, cardiovascular disease, strokes, obesity and depression. Sleep, Thomas said, is key to building a happy and healthy lifestyle. 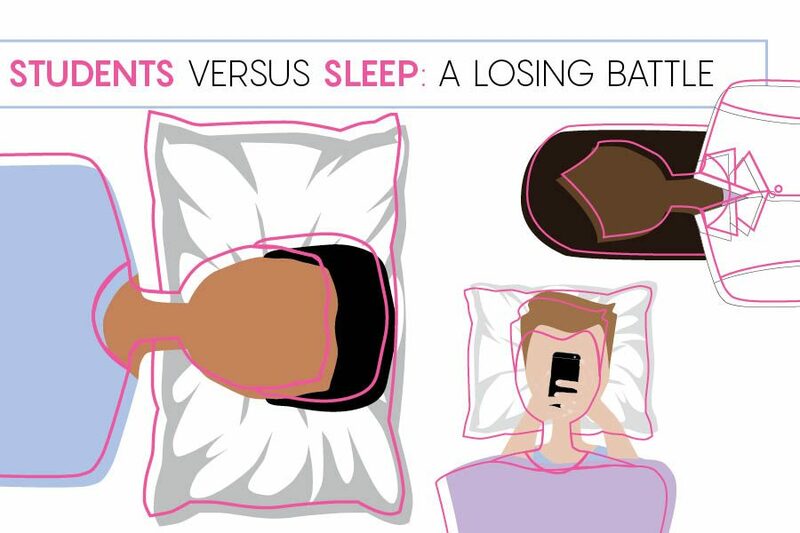 The use of technology has often been linked to causing irregularities in sleeping patterns. According to the National Sleep Foundation, the blue light emitted by screens may suppress the release of melatonin, inhibiting sleep and causing you to stay up later than you normally would. 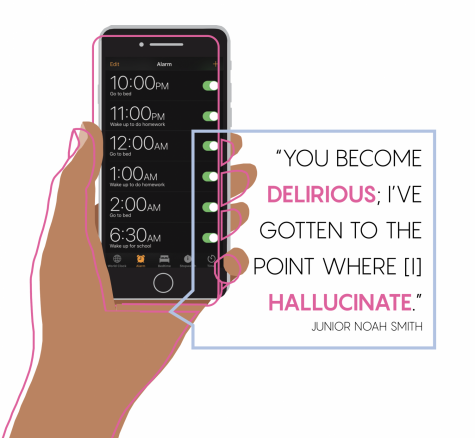 For sophomore Christina Talavera, using her phone right before going to sleep has become routine, even though she recognizes that it negatively affects her sleep schedule. Similarly, Kemp experiences the desire to use her phone even though she has decreased her screen time before bed. However, she has found ways to reduce this usage, such as using the “night mode” feature on her phone. On the other hand, white noise machines or apps can also be used to help one fall asleep better, or to regularize sleep schedules. For example, sophomore Avery Liby uses the app Sleep Pillow in order to ease the process of falling asleep. According to the National Sleep Foundation, eight to 10 hours of sleep is required for most teenagers to maintain a healthy lifestyle. While this schedule fluctuates depending on the person, these hours are fairly standard. However, Ehtesham said most students don’t receive this much sleep. “On average, most high school students get 6 -7 hours [of sleep] in our experience as they are busy with homework, phones or TV, and sometimes don’t give enough importance to sleep,” Ehtesham said. Although many students think they can cope with sleep loss, Thomas said that all high schoolers need approximately the same amount of sleep. However, some use alternative sleep schedules to help manage their time. Junior Noah Smith, for example, has adopted a schedule known as polyphasic sleeping, or “interval sleeping.” The sleep schedule includes sleeping in different segments, as opposed to having one continuous period of sleep. 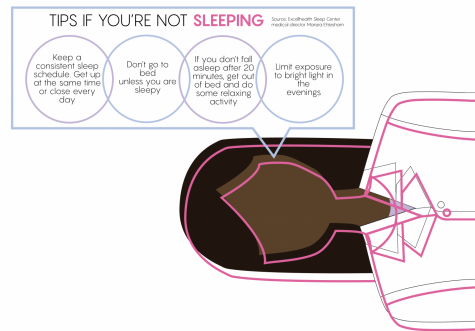 Although Smith admits that he depends on interval sleeping during more busy and stressful times, he warns students of its risks. In contrast, junior Delaney Kemp chooses to sleep earlier in the evening and wake up early in the morning to complete her homework. Kemp gets eight to 10 hours of sleep a night, on average. Sometimes, though, prioritizing requires sacrificing nonessential activities, as physics teacher Ryan Johnston realized after balancing college classes, teaching and caring for his infant daughter. Receiving help from a doctor or visiting a sleep center if you’re not getting enough sleep is imperative to rebuilding your sleep schedule. A sleep center, according to Ehtesham, helps to advise patients on healthy sleep habits, diagnose any sleep disorders and treat problems relating to sleep deprivation. In order to establish a healthier sleep schedule, Ehtesham recommends getting up and going to bed at nearly the same time daily, avoiding going to bed unless you are truly “sleepy,” establishing a relaxing nightly routine and staying away from large meals before bedtime. For Haase, who has struggled with self-diagnosed insomnia for her entire life, getting help from a doctor was imperative to balancing her sleep schedule. Although melatonin supplements were ineffective for her, other prescription medications have helped. For less extreme difficulties with sleep schedules, Johnston recommends reevaluating your daily responsibilities. Brown also recommends altering your schedule to fit in sleep. “Drinking water and making sure there’s a lot of colors on your plate at meals — getting enough vitamins and the right kinds of foods — will actually supply energy better than drinking coffee in the morning because you won’t have that crash,” Kemp said. Ultimately, Johnston stresses that sleep is a huge factor in overall health and well-being.